Just waiting on Finnr and Guntram's actions. Finnr readies his spear and shield. He smiles grimly at the thought of slaying his captors. He will move to the front line and prepare to get some revenge. Guntram [autopilot] moves into the shadows to the east as best he can, readying his flail. Grimma moves north with Dolgrim and Oberon. Bart sticks close to Fenwick. The shuffling grows closer, and with it a dim glow that rounds the bend to the west and exposes what is stalking you. What draws your eyes first is an imposing demonic figure that was perhaps human long ago, but is now eroded into a mix of flesh and ashes. A cloud of glowing ash surrounds it, and its eyes glint, burning with a red and evil light. There are three man-sized demons surrounding it, their faces marked with a smear of ashes in the shape of eight outward-pointing arrows. The demons are 40 feet from you and will close next round. Actions? Finnr will throw his spear at the leader of the demons. Next, he will draw his magic shortsword and move forward to attack. Fenwick casts sleep and seriously considers becoming religious. Aren't we 1st level? Yikes! Dolgrim puts away his hand axe and reaches for his sling. He pulls back firmly and lets a stone fly towards the creatures approaching. 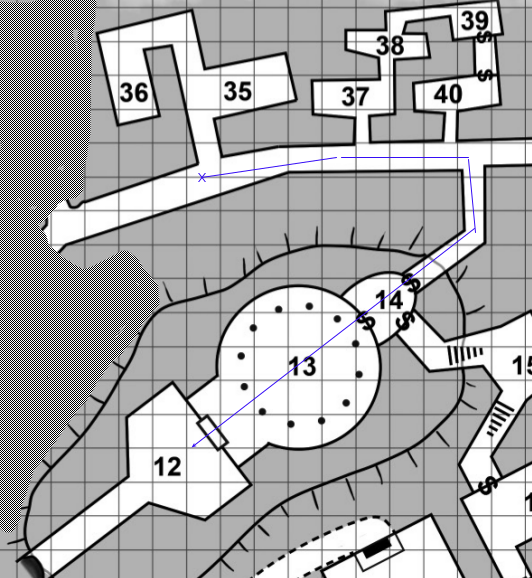 After shooting his slingshot, Dolgrim will heed Oberon's call and fall back: "Let's make our way back to the circular column room and head for the main entrance! If we don't already shake them off by taking the secret passage I'm sure they won't follow us into broad daylight!" Finnr will throw his spear and beat a hasty retreat with his new found friends. "Gods! What I wouldn't give for a barrel of holy water!" Fenwick briefly considers casting a sleep enchantment, but realizes that demons don't sleep, and would therefore be unaffected. Ref ruling - Fenwick would know his spell would not be effective, and would not waste it. Unless you really want to . Finnr throws a spear at the ash-cloud demon, but it just misses him, clattering down the tunnel. Dolgrim launches a sling stone that connects with one of the advancing demons in a small puff of smoke. Guntram [autopilot] holds forth his holy symbol, beseeching the Goddess to turn away the demons, but they continue to advance. 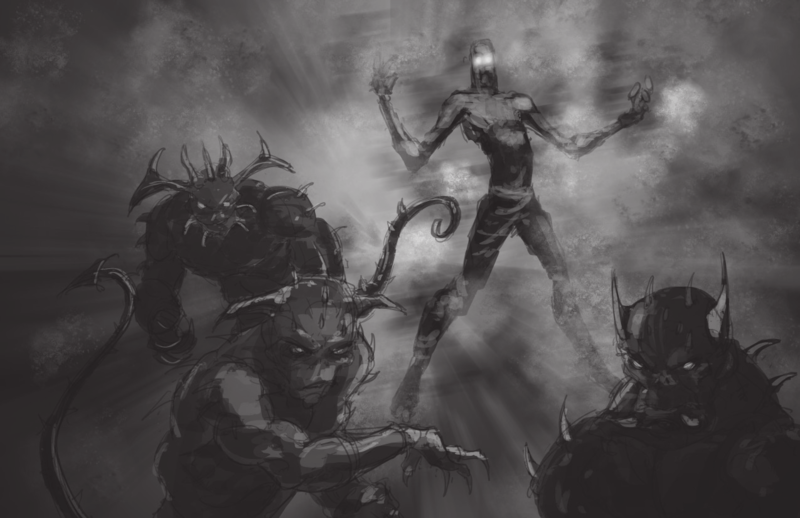 The party retreats but not before a cloud of glowing ash flies forth from the taller demon, enveloping Oberon's head and shoulders completely. Oberon chokes and spits, and with a gasp somehow manages to free himself from the cloud. For a brief instant he felt as if he would choke to death on ash. You are moving quite a bit faster than the group of demons and quickly outpace them, finding your way through the secret door and back to the pillar room. The green glow emanating from over the double doors is somehow comforting now. You stop for the moment - you do not appear to have been pursued. You are at #12 on the map below. The exit is just to your southwest. Actions?